Founded in 1955, the Enfield Archaeological Society is active in carrying out research and fieldwork in and around the London Borough of Enfield, in order to understand and preserve its history. Our main aims are: to promote the practice and study of archaeology in the district; to record and preserve all finds in the borough and encourage others to allow their finds to be recorded by the Society; and to co-operate with neighbouring societies with similar aims. Membership is open to anybody with an interest in the past. All members of the society over the age of 16 are welcome to dig with us – no experience is necessary. We typically run at least one dig a year in the summer, on the site of Henry VIII's Elsyng Palace with other work often cropping up through the rest of the year. 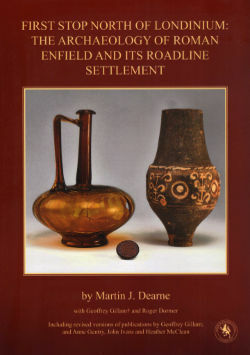 A definitive description and analysis of all the known Roman archaeology in the north London borough of Enfield, this monograph brings together antiquarian finds and re-presented and augmented reports on work from the 1950s to 1970s with the more recent excavations of the EAS as well as Museum of London Archaeology. With prefatory chapters on aspects of the area including its prehistory, the volume documents what is known of the settlement that grew up here alongside Ermine Street, the road itself, a possible tannery, other settlement sites and often higher status burials. A synthetic chapter examines the role of all small roadside settlements around Londinium in terms of function, chronology and their relationship to the provincial capital and discusses the possible economy of this area of the Lea valley. With full illustrated stratigraphic and finds reports for over 45 individual sites (including samian ware, brooches, metalwork and important Roman glass finds), it presents the evidence for what may have been a broadly rural landscape, but with a quasi-urban settlement that may have reflected the needs of a cursus publicus system operating along one of the main roads of the province. 355 pages; 137 black and white and colour figures; 19 black and white and colour plates. We will be returning to Forty Hall this summer from the 16th to 28th of July to continue our investigation of Henry VIII's Elsyng Palace. We've spent the last couple of years investigating an area between the south side of the palace's outer court and what we now know to be part of the extensive complex of service ranges belonging to the palace kitchens. Last year's star feature was a complete Tudor furnace belonging to what we believe to be the palace 'boiling house' - a department within the kitchens responsible for boiling large joints of meat in preparation for roasting and other uses including pie-making. The furnace and associated multi-phase brick floors also played a starring role in Channel 5's "Digging Up Britain's Past", in which Alex Langlands helped us to excavate the remains of the ash deposit left behind after the furnace's last firing, probably some time in the early 17th century. Earlier in the year we also continued to explore a building adjacent to the boiling house which defines the south side of the outer courtyard. Documentary and archaeological evidence suggests this is the 'Long Barn' -- most likely a storage barn serving the kitchen block and possibly connected to a small stable at its east end. The main outstanding question from last year's dig is how far east the boiling house extends, alongside the barn. We found that part of the brick floors and the southern facade wall of the boiling house were truncated by a large demolition cut and so were unable to define the building's eastern limit -- this will be the main aim of this year's dig. The first trench (see diagram) will look for the east side of the demolition cut and a continuation of the boiling house's southern facade wall (and hopefully more of the interior of the building), while the second trench (a few metres to the north of the diagram) will pick up the edge of the barn where it meets the boiling house, and similarly follow it east. The second trench will also hopefully tell us more about the barn and hopefully give us a chance to see some of its interior in more detail. If you would like to dig with us, you must be a member of the Society and over the age of 16. See here for details on joining. Please bear in mind the number of places may be limited, so the sooner you join the better. Alternatively, the Saturday of the 27th will be a public open day with exhibits explaining our work and members of the Society will be on hand to answer your questions. You can interactively explore some of last years work at sketchfab. It was with a mixture of regret and relief that this year's dig on the site of Henry VIII's kitchen ranges of Elsyng palace drew to an end. We've worked very hard for the last two weeks in sometimes impossible heat and will be glad of a well earned rest, but we'll leave behind some of the best preserved palace remains found on the site in more than 50 years. Over the course of the dig we've pieced together a fascinating and complex story of the construction, modification, repair and demise of what we think was the palace boiling house, which has given us one of the most detailed ever insights into the palace's history and adds to an increasingly detailed picture of the layout of the palace complex between the outer and inner courts. One of the compelling aspects of Elsyng has always been its unpredictable nature. Unlike other showcase palaces, Elsyng was not built to a single grand plan, and this has always been evident in the archaeology. Wall alignments are rarely square and building layouts almost never symmetrical, and just when you think you have a handle on a building's layout, the smallest trench extension can often throw you a curve-ball. This year's dig delivered an archetypal surprise yesterday, with the sudden emergence of the foundations of an octagonal turret in the corner of the furnace trench, where we expected a simple linear wall connecting to the twin garderobes a few metres away, which we excavated in 2014/15. Having established that we'd found a very shallowly buried octagonal turret and with building time pressure, we deturfed along the top of it, hoping to simply record its outline before returfing and resuming the task of backfilling the furnace trench. The further we went, however, the more complex things became. The turret turned out to be attached to a second, larger octagon, making a pair of conjoined turrets (one 1.6m in diameter and the other 3m), which did eventually return to a straightforward wall which seems to be on the correct alignment to join the garderobes. The final complication came on the last corner of the larger octagon, where a small wall appears to have been attached to it. This wall runs very close to the 2014 garderobe trench, which showed no sign of the new wall so at the moment we have no idea whether this wall is truncated before it reaches that far, if it turns or even if it is part of yet another turret. Sadly we ran out of time to investigate any more of these features this year, so having planned and drawn their tops, they were returfed and the rest of the day was spent backfilling. Post-excavation work begins now - one of the first tasks will be to put all of these new features together with the complete layout of the furnace that we now have, onto a single plan which may make it easier to get an understanding of the building's layout and development. As ever, results of this year's work will eventually be summarised in future editions of the Society newsletter. We are now also making progress on the preparation of a comprehensive publication of all the work undertaken on Elsyng since 1963, together with an extensive study of the available documentary evidence (for example the will of Sir Thomas Lovell - available to read here). Together with other models of the dig's trenches at sketchfab. A big thankyou is owed to our members who stuck it out through the harsh weather, and especially to those of you who came to help backfilling, most of all the dedicated band who were able to stick with it to the end of the day. Without your hard work and dedication, Elsyng would still be a 'lost palace'. The Will of Sir Thomas Lovell, K.G.